Big Shug has a gargantuan significance in the Boston hip hop scene. With the 2005 release of Who’s Hard?, Shug made his personal album debut into the hip hop market. However, his involvement is infinite and perhaps most memorably captured by his verse in Gangstarr’s classic "The Militia." Having encouraged Guru to begin rapping in the first place, Shug is largely responsible for establishing the Boston hip hop community. His new release entitled Street Champ is more evident of that than anything, featuring singles with Singapore Kane and Boston’s own Edo G, it looks to launch Shug even further above the clouds of Boston hip hop’s legendary status. 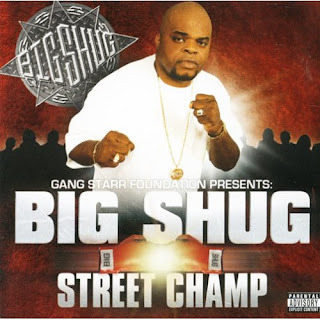 Staying true to the Gang Starr Foundation formula, Big Shug recreates his indelible bond with DJ Premier on Street Champ with three tracks, including the street-banger ''It Just Don't Stop.'' For round two, however, Shug also taps rising producer MoSS to guide his sonic tour de force. Street Champ also features guest appearances from Termanology, Sean Price with the latter joining forces with Big Twins from Infamous Mobb on the massive posse cut ''Leg Breakers''.